Apple is expected to rapidly deploy support for the new 802.11ac specification this year, adding so called "Gigabit WiFi" to new AirPort base stations, Time Capsule, Apple TV, notebooks and potentially its mobile devices. The new 802.11ac standard achieves much faster wireless networking speeds than the existing 802.11n specification (in use on the latest Mac, AirPort and iOS devices) by using 2 to 4 times the frequency bandwidth (from 80 to 160MHz), more efficient data transfers through sophisticated modulation, and more antennas (up to 8; existing standards support up to 4, while Apple's Macs currently use up to 3). While not yet finalized as an official standard by the 802.11 Working Group, progress on the new 802.11.ac standard is occurring faster than previous efforts in wireless networking have. Multiple suppliers have already issued chipsets supporting 802.11ac for consumer grade applications. Key Apple component maker Broadcom announced chips supporting the standard earlier this month at CES. In addition to reaching networking speeds above 1 Gigabit (about three times as fast as 802.11n networks can manage), 802.11ac promises better networking range, improved reliability, and more power efficient chips, thanks to parallel advances in reducing chip size and enhancing power management. While Apple wasn't the first company to sell wireless devices, it was first to bring the technology into the mainstream beginning in 1999, when Steve Jobs dramatically demonstrated Apple's initial AirPort technology onstage at the July Macworld Expo as "one more thing" after showing off the company's new consumer iBook notebook. Jobs pretended to hold his new iBook notebook up to provide a clear view for the camera operator, but he then continued to use the web as he walked across the stage to the delight of the audience that suddenly realized the new notebook had a wireless connection. While Intel and others were promoting wired home networking schemes using landline phone wiring, Apple quickly brought WiFi into common use with support for AirPort across its Mac desktop and laptop line and its new AirPort branded base stations, making secure wireless technology both affordable and easy to use. The WiFi technology Jobs demonstrated was second generation 802.11b; an earlier 802.11 version had previously been developed but only offered a tenth of the speed, making it less than practical for mainstream users. At the same time, 802.11b wasn't formally ratified until September of 1999, making Apple's inclusion on the iBook a forward-looking innovation. It also made the iBook the first mainstream computer sold with integrated WiFi. In January 2003, Apple launched AirPort Extreme, its brand name for the improved 802.11g standard. While backwardly compatible with 802.11b devices, the new AirPort Extreme base station and compliant computers could now achieve wireless networking speeds up to five times faster. The 802.11g standard wasn't formally ratified for another six months after Apple released its first implementation of it. In September 2006, Apple offered a sneak peek at Apple TV. It seemed immediately obvious that Apple would empower this using the new 802.11n standard, but it was widely doubted at the time that Apple could release support for the much faster new version of WiFi before the standard was ratified. However, in January 2007 Apple announced that Apple TV did indeed use 802.11n, alongside new AirPort base stations also supporting a draft version of the still unfinished specification. The company also acknowledged that it had secretly included support for the fast new "draft n" specification in all of its previously released Core 2 Duo Macs. Due to accounting concerns, Apple planned to charge a nominal $4.99 fee for distributing the drivers needed to activate this unadvertised hardware feature on recent Macs. After a hailstorm of caustic criticism, Apple dropped the fee to $1.99, and subsequently included the drivers into the next version of Mac OS X for free. The 802.11n standard wasn't formally ratified until October of 2009, nearly three years after Apple began rolling it out. By May 2008, Apple was recognized by NDP Group as having a 10.6 percent share of WiFi base station sales, and AirPort Extreme was named the top selling 802.11n router in the US. The new 802.11ac isn't expected to be fully approved as a finished standard until late next year, but Apple is poised to adopt it well before then. Since the initial rollout of 802.11n Macs, AirPort base stations and Apple TV in early 2007, Apple has incrementally advanced support for new facets of the 802.11n specification and has also developed new practical applications tied to wireless connectivity. In 2008 Apple launched support for 802.11n base stations and clients operating in the 5GHz band at the launch of Time Capsule. In this frequency band, WiFi devices can double their bandwidth allocation to a wide 40 MHz to allow faster networking speeds, nearly doubling the theoretical maximum. For existing Macs, this boosted top speeds from 130 to 300 Mbps. In 2009 Apple enhanced AirPort Extreme and Time Capsule products with support for simultaneous 2.4 and 5GHz band operation and guest access. The following year, Apple launched iPad with support for both 802.11n and 5GHz networks. iPhone 4 followed with support for 802.11n, although it could not connect to 5GHz networks. 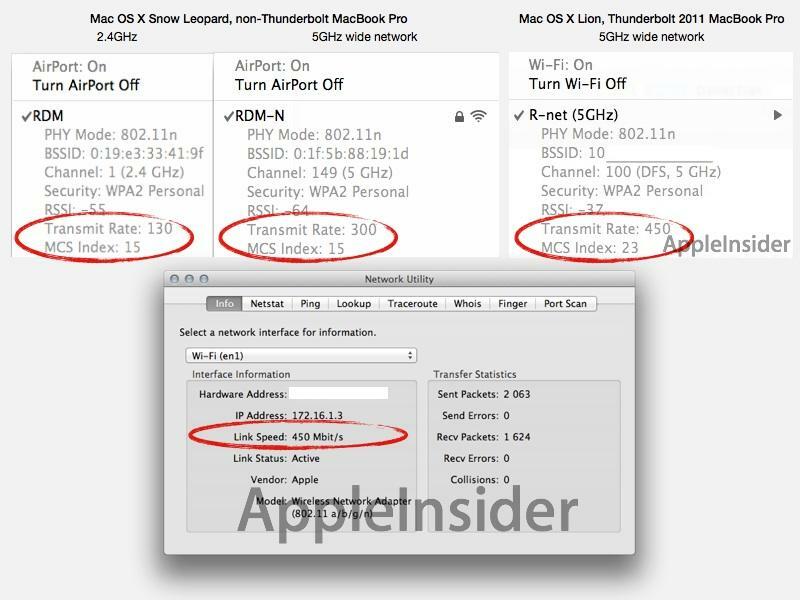 Last year, Apple's Thunderbolt Macs silently incorporated support for three send and receive antennas, enabling them to achieve a top data rate of 450 Mbps on 5GHz networks with wide channels. Apple also enhanced its AirPort Extreme and Time Capsule last summer, increasing their range and radio power output and adding support for new Mac's triple antennas while extending simultaneous operation to automatically use both 2.4 and 5GHz bands. 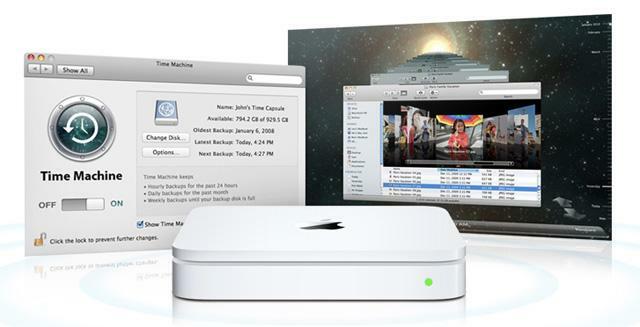 In addition to hardware advances, Apple has introduced a variety of technologies that focus on WiFi networking, including Bonjour-discoverable disk and printer sharing from AirPort Extreme base stations, AirTunes wireless audio distribution introduced alongside AirPort Express, and Mac OS X Leopard's Time Machine backups designed to work with Time Capsule. Last year, Apple introduced AirPlay as a replacement for AirTunes, enabling iTunes and iOS devices to wirelessly stream both audio and video to Apple TV. AirPlay Mirroring on iPad 2 and iPhone 4S enable those devices to export their primary video display to an HDTV via Apple TV. In Mac OS X Lion, Apple introduced support for AirDrop, enabling nearby users to share files without configuring a WiFi network. The tremendous speed gains possible with 802.11ac will continue to make Apple's wireless technologies from AirPlay to Time Machine faster and more efficient, virtually erasing any advantage in using wired network cabling in most cases.